Welcome to the first in a new series of blog-posts, delving into the personalities of our cast. You’ll get to know some better than others throughout Tove’s journey, but either way what you see of them in-game is just the tip of a big ol’ iceberg. 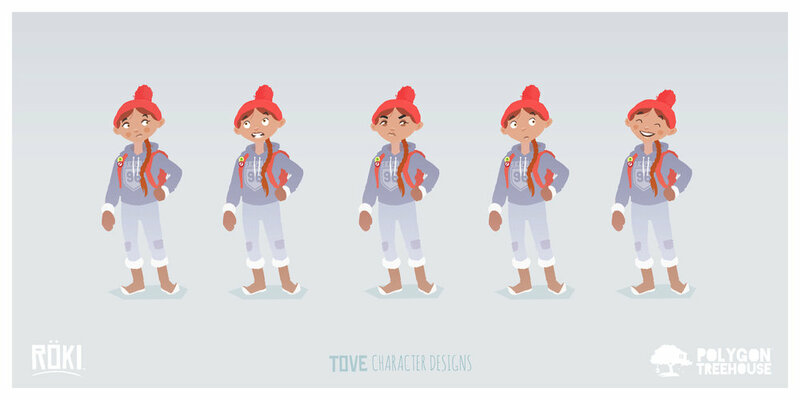 So, let’s kick things off with the fresh-faced heroine of our tale, Tove. Oh, and let’s just say, we’ve removed a few spoilers here and there, so don’t think by reading these there’ll be nothing left to discover. Tove is mature for her age, on account of having to bear responsibility for her young brother Lars due to her father's general uselessness. She’s quick-witted, resourceful, kind (if a little quick tempered) and adventurous. Yet, underneath it all, Tove wonders whether she isn’t missing out on – what, exactly? – she doesn’t know. But she’s restless, and even her beloved horror movies are starting to feel like a routine. Inventing new (annoying) pet names for Lars. Exploring the wood and mountains near her home. She's recently started learning to boulder and is developing a keen interest in botany/ecology. Occasionally talks to herself in the 3rd person. Dealing with ineffectual father and looking after Lars. Staying and learning to be safe while exploring and adventuring. Lars wanting to always follow her. Repressed anger towards her dad, and even unconsciously towards Lars. Her desire to explore and be free vs. Her love and sense of responsibility towards Lars. Fear that she'll never be the one that is looked after again. Her old toys, and finding junk around the house. The dark, it's boring and gross. When Lars has a tantrum or won’t leave her alone. Puzzles that she can’t quickly figure out. Climbing, trekking, the forest flora and fauna. A roaring fire and a huge mug of cocoa. When Lars finally does what she asks. Tune in next week for a look at Lars.